Diamonds are typically bought and sold by carat weight. 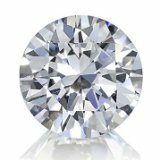 Since high quality diamonds are cut with standard proportions, you can buy a setting designed for a round brilliant diamond of a specific carat weight, such as 75 points or 1 carat. The diamond you buy will almost always fit the setting designed for that carat weight. The colored gemstone business is quite different. Though rubies, sapphires and other colored gems are sold by carat weight, they really need to be purchased by size. It's not possible to purchase a ring setting designed for a round 1.5 carat sapphire, because sappires with that weight can vary considerably in size. In addition, the ring mounting that will fit your 1.5 carat round sapphire is unlikely to fit a 1.5 carat round zircon or tourmaline. 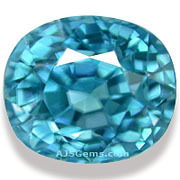 Settings for colored stones are always sold by size, rather than by carat weight. The explanation for this difference has to do with two properties of colored stones -- their density and their cut. The various gemstone materials vary by density, sometimes significantly. Density or specific gravity is measured as the ratio of the density of the gemstone to the density of water. 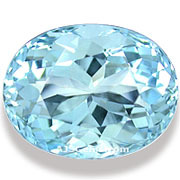 It is expressed as a number which indicates how much heavier the gemstone is compared to an equal volume of water. A higher number indicates a higher density. Gemstone density varies by the chemical composition of the material. A number of popular colored gemstones are substanially denser than diamond, including all the garnets (such as spessartite, tsavorite, demantoid and rhodolite), corundum (ruby and sapphire), zircon and chrysoberyl. 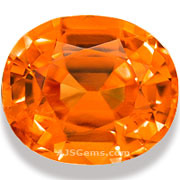 This means that a 1 carat spessartite garnet, for example, will be noticeably smaller in size than a 1 carat diamond. 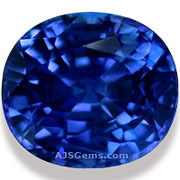 Buying a garnet or sapphire by carat weight often leads to disappointment when the gem appears smaller than expected. On the other hand, some colored stones have a lower density than diamond, including tanzanite, chrome diopside, spodumene (kunzite and hiddenite), apatite, fluorite, jadeite, tourmaline, prehnite, beryls (emerald, aquamarine, morganite and yellow beryl), quartz (amethyst, ametrine, etc.) 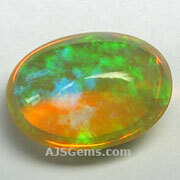 and opal. Colored gemstone also tend to be cut quite differently from diamonds, with more weight in the bottom or pavilion of the gemstone in order to maximize color. This means that colored stones tend to "face up" smaller than a diamond of similar carat weight. 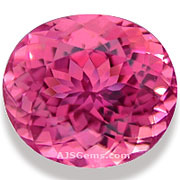 For example, spinel is a gemstone with a density just slightly higher than diamond. But a 1 carat spinel will usually have a smaller face than a diamond of similar weight because of the heavier pavilion. When these two considerations -- density and cut -- are combined, the size of some colored gems can be dramatically different than the buyer expects, especially if the buyer's expererience is mainly with diamonds. In practical terms, this means one has to be very careful when buying a colored gem, especially a ruby, sapphire, garnet or zircon, for an existing setting. In this case it is crucial to know the exact size of the setting and select a gem by size, not by weight, to fit. On the other hand, buying a lower density gem by carat weight can result in receiving a gem larger than one expected. This can be true for gems such as tourmaline, quartz, beryl, kunzite, moonstone and opal. By way of comparison, a 2 carat oval opal would have a typical size of 11 x 9 mm, while a 2 carat oval diamond would be only 9 x 7 mm, a difference of nearly 40%. Finally, we should note why there is some variance in the "face up" size even for, say, oval 1.5 carat sapphires. The reason is that colored gems are usually cut to produce the best color. A lighter colored stone may be cut with a more generous pavilion in order to deepen the color, while a darker stone may be given a shallower cut to lighten the color. Unlike diamonds, every colored gem tends to be unique. So experienced buyers always check the size as well as the carat weight when buying a colored stone.